One of our key areas of expertise in recent years has been working on branding and retail design within the wine trade. Two great contrasting projects are for the high street retail chain Oddbins, and secondly for the French business Le Verre Gourmand, who supply hotels, chalets and restaurants from their base just outside Chamonix. 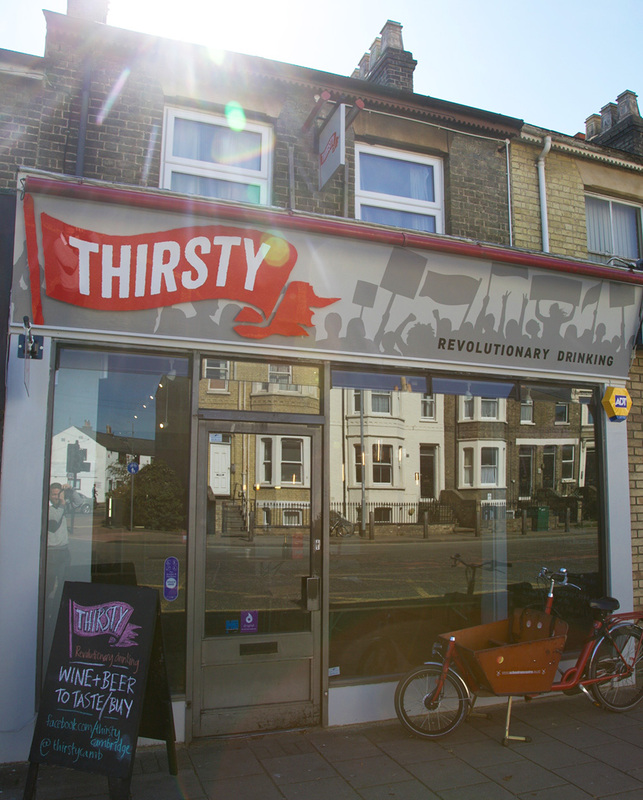 We have also realised a long-cherished dream and devised a wine retail brand from scratch, Thirsty in Cambridge. Our work for Thirsty includes brand design and development from concept to signage. 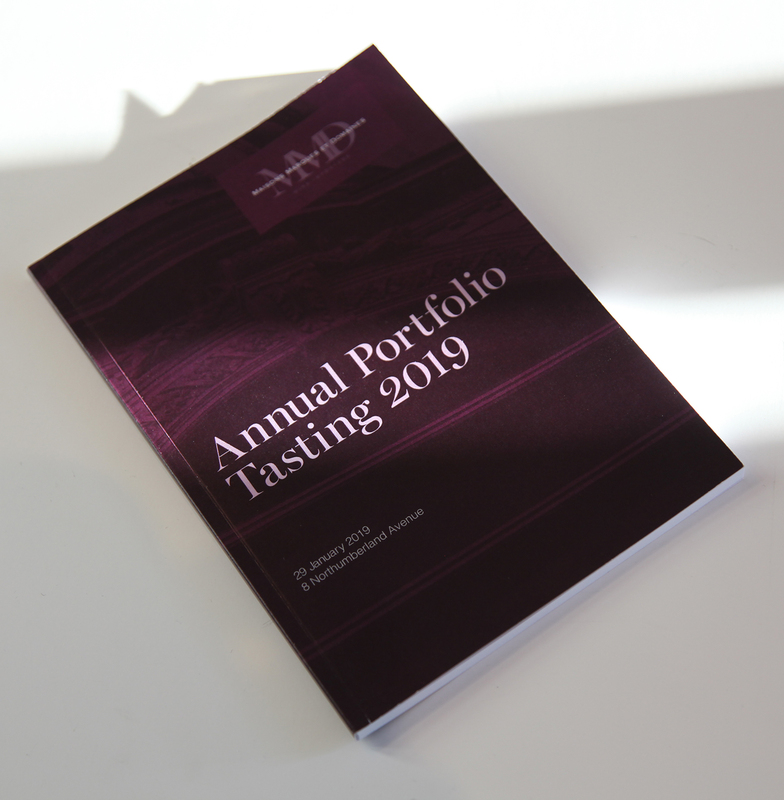 Recently we’ve started working with Louis Roederer’s UK wholesale arm Maison Marques et Domaines on branded materials including their 2019 Wine Portfolio. We’ve moved from producer to product with the design of a full suite of wine labels for a new wine brand, Chemin des Pins. This rounded off our experience working on every aspect of the process. This project is a really exciting one – the development of a completely new retail concept. Working with our long-standing client Le Verre Gourmand, we have developed a new brand called Thirsty. It’s a fantastic project with a striking, bold shopfront in the heart of Cambridge. And it’s caused quite a stir. Using the graphic language of the protest as a backdrop, this gutsy new shop is ruffling feathers and re-imagines how wine (and craft beer) is bought in one of the student capitals of the UK. Their second store opens in Spring 2019. A really satisfying piece of work was the creation of a completely new brand of wine, named Chemin des Pins. An unusual piece of wine retail design work, it focussed on the product being sold, rather than our usual work marketing the product. The end result is a full set of wines which form part of a range of ‘premium vin de table’ products which is sold wholesale to restaurants and ski chalet companies in the Chamonix and Megève holiday centres of eastern France. At the turn of every year, Louis Roederer’s UK trade arm Maison Marques et Domaines holds a ‘Portfolio Tasting’ event in central London. 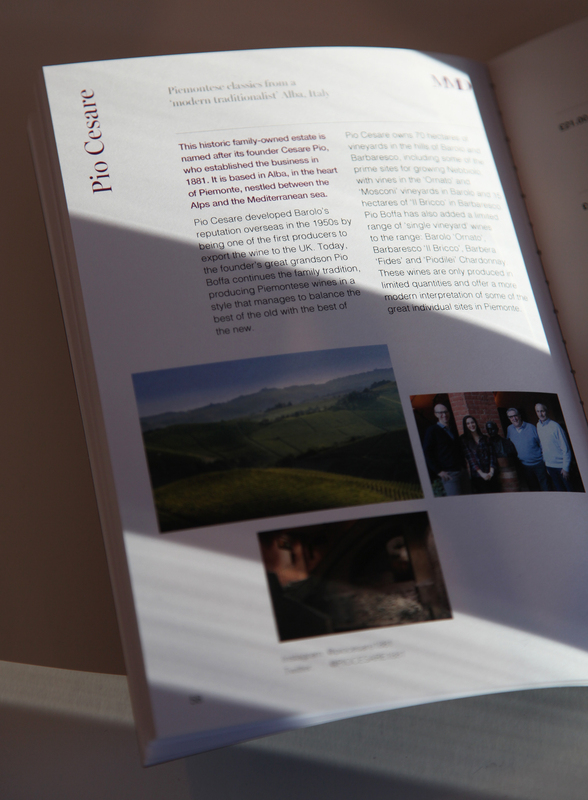 They invited us to design their 2019 print brochure for the occasion which incorporated detailed information of every producer involved as well as every vintage featured. The end product was a stunning piece of modern print which enhanced the brand and ensured every aspect of the experience was polished for the hundred of trade visitors in the press and industry buyers. 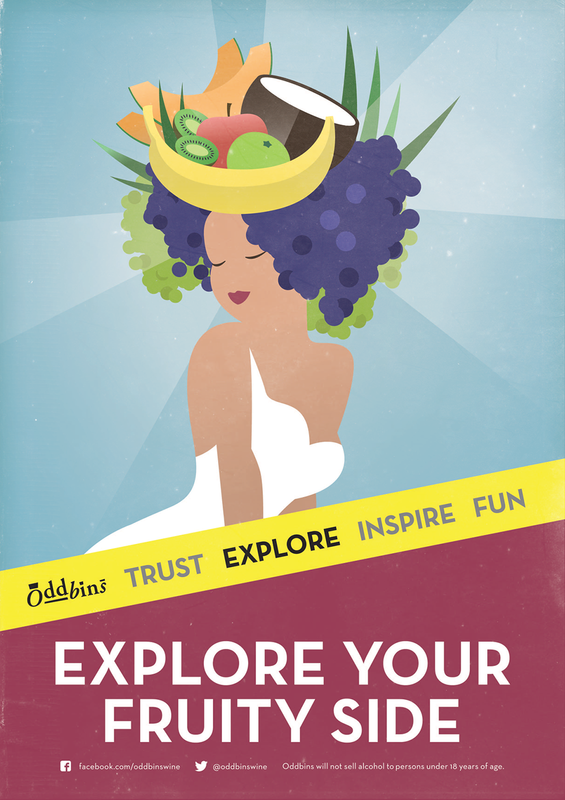 Our work with Oddbins began in a very simple way, designing a series of store-front retail posters. Following a buy-out and restructuring, the business had very little in the way of in-store print materials, never mind the specific wine retail design collateral it needed in-store graphics, point of sale and so on. Our first major project for Oddbins was a redesign of their in-store graphics, shelf-edge signage, in effect giving the stores a subtle makeover. Our design concept was taken from the design of the brand identity which we felt had never really been exploited and carried into the stores. So with this in mind, a brand language was developed and launched in store-front posters as well as this signage. It’s a great example of how a well-known brand can have a fresh look without expensive store-refits, and taking an identity long-term customers know well and giving it a fresh twist. 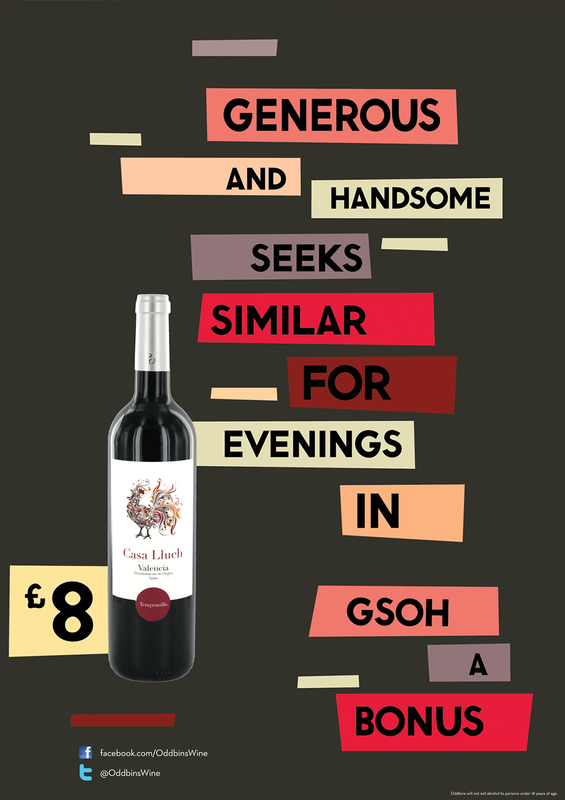 These are a couple of examples of our favourite store-front posters for Oddbins. We’ve designed hundreds of these, usually directed by the in-house marketing teams, using ongoing themes which usually run for a year at a time. Each set lasts a month, and there are usually four each time, including one that local teams can use to write special offers or new product. Alongside these posters sits a set of customised price labels so the whole store has a unified, single look. It’s a great example of how a wine retail design campaign can have a cohesive feel that starts on the street, draws in customers and takes them on a journey – hopefully to discover new products. Following our other work in the wine industry, were approached by international wholesaler Le Verre Gourmand to design a new brand look for their business. Using custom type and a specially designed travel-style stamp, we created this memorable, bold identity which is used at their warehouse just outside Chamonix, in France. The brand design appears extensively across signage, vehicle branding, shelf-edge labelling, stationery and other materials such as invoicing and in-house print materials. The brand has been a huge success for the company and has coincided with the move to a new warehouse and significant growth in trade. In an industry where investing in design is a little unusual, using custom design and deploying it carefully has proven a smart move. The team believe that having a instantly-recognisable brand is key for the company as they visit restaurants, bars and chalets in the area around the warehouse which are busy year-round with tourists, but particularly during the ski season. It’s a bold and persuasive symbol of a growing business. ‘Sometimes the right design solution isn’t necessarily the most adventurous or wacky route – which was very much the case with our new ‘Chemin des Pins’ wine brand.